Gives You Peace of Mind: Searching for cute, practical crossbody bags? Ours is made with security in mind, with a theft-deterring RFID pocket for credit cards as well as lockable zippers. Keeps Your "Stuff" Neat & Organized: This carry bag features thoughtfully designed exterior and interior pockets. 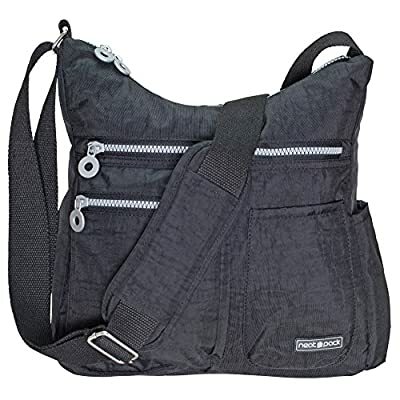 Ideal for water bottles, toiletries, electronics, books, & other necessities. Comfortable to Wear: Your canvas crossbody bag has a comfy padded shoulder strap that's adjustable to fit your height & frame. It's lightweight and won't make you feel bogged down. Everyday Durability: Tired of bags that fall apart? This carrying bag is made of tough nylon fabric that repels moisture and stains. Plus high-quality zippers that stand up to heavy handling. 100% Lifetime Money-Back Guarantee: Your travel crossbody bag is backed by our rock-solid lifetime guarantee (just register on our website to claim it). Buy this product without risk.